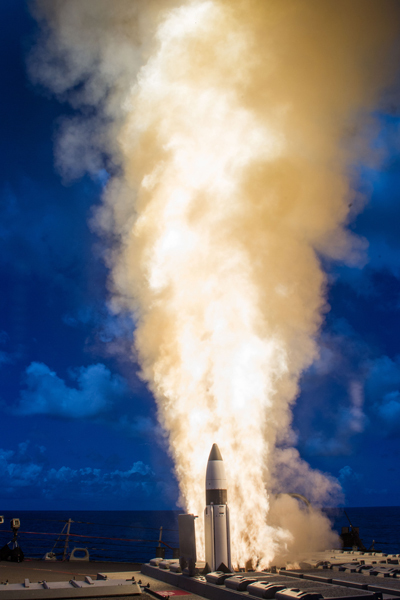 In a significant departure from long-standing U.S. policy, lawmakers voted in December to expand the declared role of U.S. national ballistic missile defenses. The measure states that it shall be “the policy of the United States to maintain and improve an effective, robust layered missile defense system capable of defending the territory of the United States and its allies against the developing and increasingly complex ballistic missile threat.” That opens the door to expanding the system beyond the currently limited goal of defending against Iran and North Korea as some, predominately Republican, backers eye actions that could upset the nuclear balance with Russia and China. The policy provision is part of the fiscal year 2017 National Defense Authorization Act. The final compromise version of that bill, which the House of Representatives and the Senate passed on Dec. 2 and Dec. 8, respectively, establishes spending ceilings and legal guidelines for Pentagon programs and the activities conducted by the Energy Department’s semi-autonomous National Nuclear Security Administration (NNSA). President Barack Obama signed the legislation into law on Dec. 23, despite having previously objected to the new missile defense language. The policy statement does not require the development of missile defenses against any one country or countries and notes that implementation is subject to the annual authorization and appropriation of funds by Congress. Yet, some lawmakers and national security analysts had expressed concern in recent years that the 1999 law was too restrictive and did not reflect the evolving ballistic missile threat environment. Last spring, Rep. Trent Franks (R-Ariz.) and Sen. Ted Cruz (R-Texas) successfully attached amendments to their respective chamber’s versions of the defense authorization bill that removed the word “limited” from the 1999 law. Franks justified the change in part by arguing that “China and Russia are both developing complex missile technology specifically designed to exploit our weaknesses,” such as hypersonic strike systems and advanced cruise missiles. Rep. Mike Rogers (R-Ala.), chairman of the strategic forces subcommittee of the House Armed Services Committee, also cited Russia and China as a motivating factor, stating at a committee discussion on the Franks amendment that the old policy was written at a time when “Russia was a peaceful partner” and China had yet to deploy long-range submarine-launched ballistic missiles. In a statement last June, the White House said it “strongly objects” to removing the word “limited” from the 1999 law. “The inclusion of this word is specifically intended to convey that the U.S. homeland missile defense system is designed and deployed to counter limited attacks (in number and sophistication) from Iran and North Korea, and not to counter the strategic deterrence forces of Russia and China,” according to the statement. Retired Air Force Brig. Gen. Kenneth Todorov, the former deputy director of the Missile Defense Agency (MDA), told Arms Control Today in a Jan. 3 interview that the change was unnecessary. “I never felt like the word ‘limited’ constrained us in any way, including our development of capabilities against the most serious ballistic missile threats,” he said. Another provision in the authorization bill encourages but does not require the Defense Department to begin research and development on a space-based missile defense option for the United States. Vice Adm. James Syring, the MDA director, told lawmakers at a House hearing last April that he had “serious concerns about the technical feasibility” and “long-term affordability” of interceptors in space. The final authorization bill removed provisions contained in the initial House and Senate versions that sought to control the cost of the nuclear-capable B-21 Raider bomber program. The Air Force is planning to purchase 100 bombers to complement and then replace the existing B-52H and B-2A aircraft. The new bombers are scheduled to enter service in the mid-2020s, and the entire fleet could cost more than $100 billion to produce, according to some nongovernmental estimates. The House bill required the defense secretary to submit a report to Congress on the value of the contract awarded to Northrop Grumman Corp. in October 2015 to begin developing the bomber. The Senate bill contained a similar reporting requirement and a provision that would have halted development of the new bomber fleet if the program exceeded certain cost growth thresholds. The Air Force has refused to release the value of the contract award and the estimated total cost of the B-21 program, citing classification concerns. Sen. John McCain (R-Ariz.), chairman of the Senate Armed Services Committee and a critic of the Air Force’s unwillingness to share more information about the price of the bomber, decried the elimination of the House and Senate cost control provisions. On weapons dismantlement, the law sets an annual limit of $56 million for NNSA expenditures in fiscal years 2017 to 2021 to take apart and dispose of retired nuclear warheads and prohibits spending beyond that amount unless a number of stringent conditions can be met. In addition to passing the authorization bill, Congress in December passed a continuing resolution that extends funding for most discretionary government programs at the previous year’s levels through April 2017, although a number of nuclear weapons programs received a special funding exemption. Lawmakers failed to pass any fresh appropriations bills for fiscal year 2017, which began on Oct. 1 and runs through Sept. 30. The House and Senate passed a continuing resolution last September to fund the government at the fiscal year 2016 enacted levels through early December and a second such measure in early December to extend funding at that level through the end of April. Most programs will be funded at the fiscal year 2016 levels, but the current continuing resolution permits the Navy to fund advance procurement activities for the Columbia-class nuclear ballistic missile submarine program at a rate consistent with the fiscal year 2017 request of $773 billion. Navy officials had warned that failure to provide this funding would delay the program and increase total costs. The bill passed in December also allows the NNSA to fund its nuclear weapons activities account consistent with the fiscal year 2017 request of $9.2 billion. Although the Air Force did not receive a similar exemption for its nuclear modernization programs, Capt. Mark Graff, an Air Force spokesperson, told Arms Control Today in a Dec. 22 email that the service “does not anticipate any adverse impacts” to the programs to develop the B-21 and new fleets of nuclear-capable air-launched cruise missiles and intercontinental ballistic missiles as a result of the continuing resolution. But Graff warned that an extension of the continuing resolution for the entire fiscal year would cause delays for these programs.